In this paper we examine the impact of India's labor regulations on employment and wages through the lens of the apparel and textiles industry, India’s largest manufacturing employer. 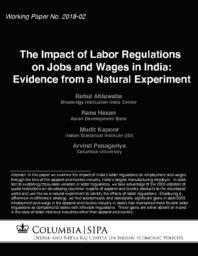 In addition to exploiting cross-state variation in labor regulations, we take advantage of the 2005 abolition of quota restrictions on developing countries’ exports of apparel and textiles products to the developed world and use this as a natural experiment to identify the effects of labor regulations. Employing a difference-in-difference strategy, we find economically and statistically significant gains in post-2005 employment and wage in the apparel and textiles industry in states that maintained more flexible labor regulations as compared to states with inflexible regulations. These gains are either absent or muted in the case of labor intensive industries other than apparel and textiles.